$45 To play TPC Las Vegas, Bear’s Best & finale at Red Rock C.C. All events are 2 person, 1 best ball, net scoring…. Multiple payouts for net results. All amounts are based on the number of tour players. Shotguns will begin at 3:00pm on all scheduled tour stops. * You must play in at least eight (8) events to qualify for the final event at Red Rock Country Club. 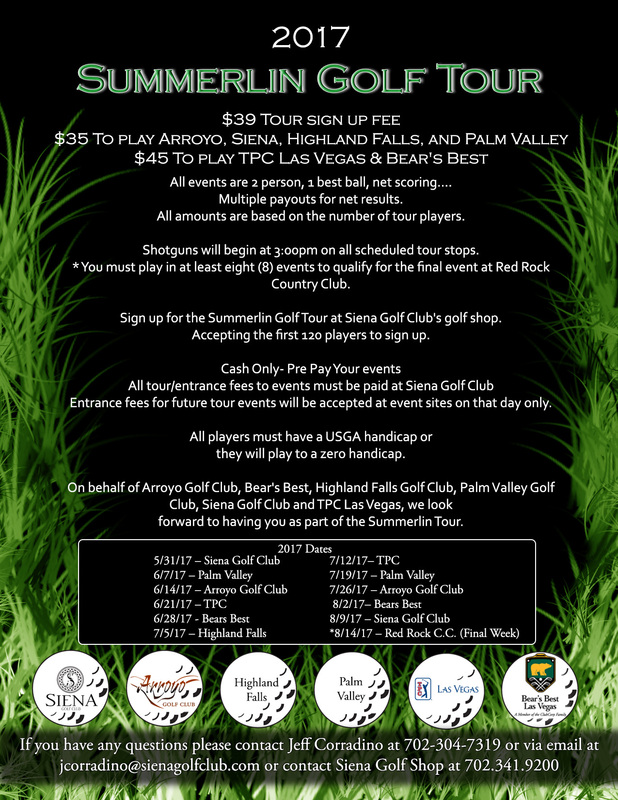 Sign up for the Summerlin Golf Tour at Siena Golf Club’s golf shop. Accepting the first 120 players to sign up. All tour/entrance fees to events must be paid at Siena Golf Club. Entrance fees for future tour events will be accepted at event sites on that day only. All players must have a USGA handicap or they will play to a zero handicap. On behalf of Arroyo Golf Club, Bear’s Best, Highland Falls Golf Club, Palm Valley Golf Club, Siena Golf Club and TPC Las Vegas, we look forward to having you as part of the Summerlin Tour. If you have any questions please contact Jeff Corradino at 702-304-7319 or via email at jcorradino@sienagolfclub.com.